The California Democratic Party claims to be for the poor and middle class, but killed a bill Monday which would have cut California’s highest-in-the-nation gas tax. Californians pay 68 cents tax on every gallon of gasoline – the highest gas tax in the nation. Not content to be the first state in the country to tax the air we breathe, California is the first in the nation to impose a cap and trade tax on transportation fuels. 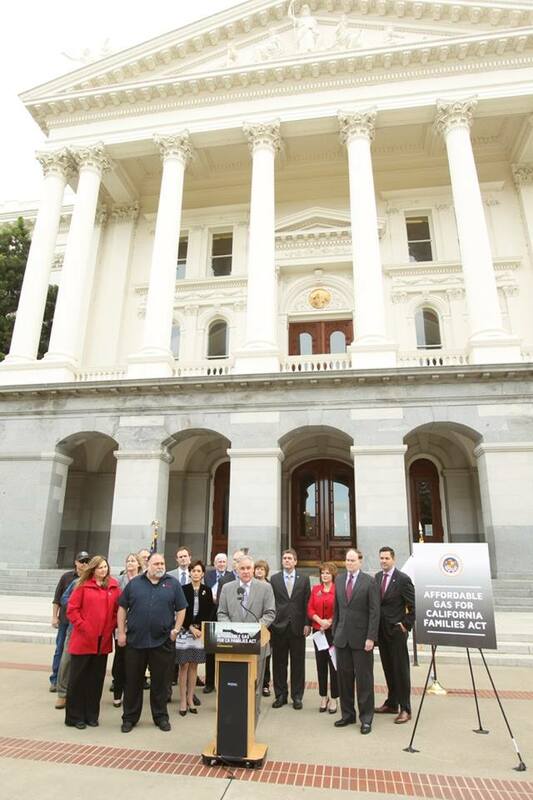 In response, Assemblyman Jim Patterson, R-Fresno, and more than 20 other Republican lawmakers, introduced AB 23, the Affordable Gas for California Families Act, legislation to exempt transportation fuels and natural gas from the California Air Resource Board’s cap-and-trade program. 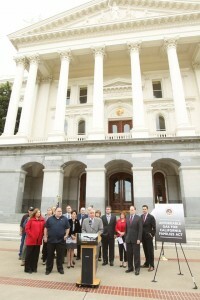 Patterson called for the elimination of this hidden gas tax. AB 23, which proposed to exempt distributors of fuels, including gasoline, diesel and natural gas from California’s cap-and-trade regulation, ironically met opposition from Democrats in the California Legislature. And in the other corner, small business owners, tax payer advocates, and even school district officials showed their support at a press conference and hearing Monday to exempt transportation fuels from California’s cap and trade program. When California’s Global Warming Solutions Act, AB 32, was passed in 2006, it was sold to the public as a necessary step to reduce dangerous carbon emissions. California politicians gloated over being the first state to enact such an aggressive policy, but have yet to produce any proof that this oppressive and business-killing law has had any “green” results. In 2006, the state’s unemployment rate was very low at the time at only 4.8 percent. It subsequently jumped to 10.6 percent, and in some economically depressed parts of the state, more than 30 percent. While many California residents have heard about AB 32, the law and its many restrictive, expensive mandates are still a mystery for most, and state officials appear to like it that way. We have no assurance or evidence that AB 32 is reducing carbon emissions, yet the California Air Resource Board has held quarterly cap and trade carbon trading auctions, extracting billions of dollars from the private sector, right into the coffers of the State of California. The bill was killed in the Assembly Natural Resources Committee Monday by a 6 to 3 vote, along party lines. The Democratic Party, which claims to be for the poor and middle class, put an end to the bill, which would have cut the cost of gas in California by eliminating the latest gasoline tax. “We all have the right to pollute ourselves but not the right to pollute others,” said Assemblyman Das Williams, D-Carpinteria, Assembly Natural Resources Committee Chairman — whatever that means. “The actions of this committee mean that tax payer funds will continue to be drained from the wallets of Californians at the gas pump to fund programs intended but not proven to reduce Green House Gases. Even the Legislative Analyst’s Office finds ‘significant uncertainty’ about the actual impact of GHG reductions that will be achieved by the many projects to be funded by cap and trade,” Assemblyman Patterson said. The California Air Resources Board predicted a 10 cent increase in gas prices however, according to the Oil Price Information Service, cap and trade has added more than 13 cents to the cost of every gallon. The tax could rise as high as 75 cents per gallon. What is the Cap and Trade Fuel Mandate? Under the CARB fuel mandate, companies that sell transportation fuels are required to comply with the cap-and-trade program regulation. But this is based on phony science regulations, created by the CARB, and a CARB employee with a mail order Ph.D. But even with full knowledge of Hien Tran’s phony credentials, in December 2008, CARB’s Chairwoman Nichols, covered up the fraud and CARB went ahead with damaging diesel emissions regulations based on Tran’s report. Grove said it is mind-boggling that in California, the third largest gas and oil producing state behind North Dakota and Alaska, we pay higher gas prices than anywhere else in the country. Automobile engines have been in constant evolution since the very beginning, and today are more powerful, quieter, more durable, less polluting and more fuel-efficient than they have ever been before, thanks to constant advancements in engine design and technology. What Mary Nichols, Chairwoman of the CA Resources Board refuses to acknowledge, and the fallacy of the CARB argument, is that combustion engines today are clean and green. It is important to note that in 1908 when the first automobile rolled off of the assembly line, average life expectancy for American men was slightly less than 50 years, and only 52.8 years for women. Today, average life expectancy in America for men is 76.4 years; for females it’s 81.2 years — a whopping improvement. The deadly exhaust fumes theory just doesn’t bear scrutiny. This gas tax is just a gas tax, and should be illegal for the CARB to impose, even under cap and trade. This entry was posted on Monday, March 23rd, 2015 at 10:01 pm and is filed under Blog Posts.